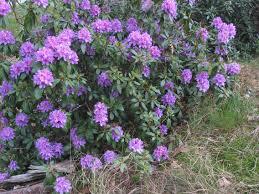 An images of established rhododendron from the internet. The rhododendron ponticum bush we bought last year is thriving. Beautiful deep purple flowers. But I was greatly cheered to see its deep purple blossoms. Other garden news: deep purple clematis, pink clematis, and white clematis by the ban; lovely purple columbines, yellow roses. The hedge we planted 3.5 years ago is massive, with wild cherries, white dog roses and pink dog roses. The rose bush we bought 4 years ago, which hardly seemed to pay its way, now does, with a mass of tiny rose blossoms. Could not bear to run in the paddock, which is now a mass of Queen Anne’s Lace. It would mean trampling it. Our garden needs a lot of work–and most of all, a pair of sturdy shears.